Hip 130, a Tapit filly out of My Conquestadory who topped the Keeneland April sale at $1.3 million. The apex of the revived Keeneland April 2-Year-Olds In Training And Horse Of Racing Age Sale was five years in the making for the auction company, but it was a years-long journey for Chris Baccari as well. The auction's most expensive juvenile, a Tapit filly who sold to Prince Sultan bin Mishal al Saud of Saudi Arabia for $1.3 million, was offered by the Kentucky-based Baccari after he spent $775,000 on her as a weanling at the 2017 Keeneland November Breeding Stock Sale. When the initial investment is so high, the stakes are lofty for ample returns, and the margin for error gets especially slim once the horses begin to reach the racetrack. Fortunately for Baccari, the filly held up her end during Monday's pre-sale under-tack show, tying for the fastest time for an eighth of a mile when she stopped the clock in :10-flat over a muddy Keeneland main track. When the hammer fell on Tuesday, the plan fully came together. The bay filly, offered as Hip 130, is out of the Grade 1-winning Artie Schiller mare My Conquestadory, making her a full sister to Grade 2-placed Kentucky Derby hopeful Bourbon War. However, the big brother was just a yearling when Baccari bought the weanling sister at the Keeneland November sale. Even before My Conquestadory was a graded stakes producer, she was still a young broodmare of note in her own right, and perennial leading sire Tapit's resume has repeatedly spoken for itself. What made Baccari go to the price he did, though, was what the filly did differently from the norm. Weanling-to-yearling pinhooking comprises a significant portion of Baccari's bloodstock portfolio, and as such, the filly was entered in the 2018 Keeneland September Yearling Sale. She was ultimately scratched from the sale before going up to the ring, but Baccari had a backup plan. The filly was sent to Florida to work toward the 2-year-old season with Hartley/De Renzo Thoroughbreds, an operation that helped Baccari enter the horse racing sphere about a decade ago. The Keeneland April sale was targeted to offer the filly, to allow the late-born juvenile time to develop and to breeze on a dirt surface. Chad Schumer signed the ticket on behalf of the buyer, who made a big splash earlier this year at the Ocala Breeders' Sales Co. March 2-Year-Olds In Training Sale, landing a pair of horses for $600,000 or more. The sale-topper was the only seven-figure offering of the sale. The second-leading juvenile was Hip 126, a first-crop Liam's Map colt, who ERJ Racing and bloodstock agent Dennis O'Neill bought for $350,000. Consigned by Wavertree Stables, agent, the colt tied for the fastest furlong of the under-tack show, going in :10-flat. 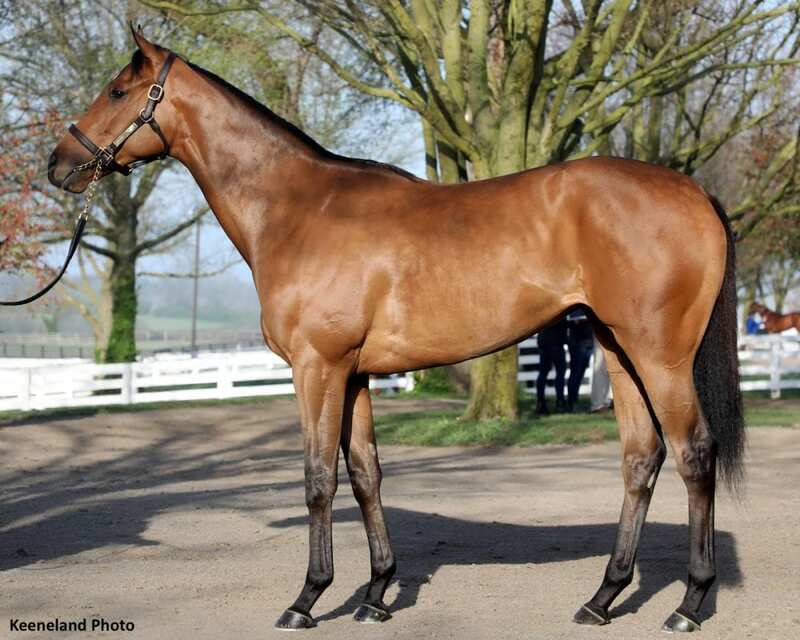 Sweet Diane was an easy one to peg as a potential topper for the racing-age portion of the Keeneland April Sale, and she lived up to the billing, going to Ina Brown Bond's River Bend Farm for $500,000. The 3-year-old Will Take Charge filly, offered as Hip 90, entered the sale with 22 points on the Kentucky Oaks trail, putting her on the cusp of qualifying for the 14-horse field. She entered the race off a third-place effort in the Grade 2 Fair Grounds Oaks on March 23, following up on a third in the Suncoast Stakes at Tampa Bay Downs in February and a second in the Hut Hut Stakes. Sweet Diane previously raced for owner Stallionaire Enterprises, and she was trained by Michael Stidham. Larry Weeden, farm manager for River Bend Farm, signed the ticket for Sweet Diane, and said trainer Eddie Kenneally would take over conditioning the filly. “We're basically a broodmare farm, and we're going to branch out, go in a new direction and do some racing,” said Larry Weeden, farm manager of River Bend Farm. “We have high hopes that this'll turn into something fun. Bred in Kentucky by Eurowest Bloodstock Services, Sweet Diane is out of the stakes-placed Tiznow mare Inside Passage, whose two foals to race are both winners. The dam is a half-sister to stakes-winner Glinda the Good, who is herself the dam of champion Good Magic. Sweet Diane will be the second horse currently in training for River Bend Farm, which has been breeding commercially for three decades with a roughly 12-member broodmare band. The operation's other runner, the 3-year-old Speightstown gelding Island Song, has placed twice in three career starts. Elite Sales consigned Sweet Diane, as agent. Tuesday's auction finished with 67 horses sold between the 2-year-olds and racing-age sessions, for revenues of $6,083,500. The average sale price closed at $90,799, the median was $40,000, and the buyback rate finished at 29 percent. With this being the first edition of the Keeneland April sale since 2014, Keeneland's director of sales Geoffrey Russell said regaining the auction's footing at a busy point in the juvenile calendar was, and will be, a challenge, but he was pleased with the returns he saw from Tuesday's returns. “I thought the trade today was very good,” Russell said. “I thought the racehorses were well-received, and then I think it continued on very well into the 2-year-old sale. “We're on our rebuilding process for this sale, so some people were willing to rebuild with us, and some people wanted to wait and see, so we hope they saw and will participate next year,” he continued. To view the full results from the Keeneland April sale, click here. This entry was posted in Bloodstock, NL Article and tagged Chris Baccari, Eddie Kenneally, elite sales, geoffrey russell, hartley/de renzo thoroughbreds, horse auctions, Horse Racing, Keeneland, Keeneland April 2-year-olds in training and horses of racing age sale, Larry Weeden, michael stidham, My Conquestadory, River Bend Farm, Sweet Diane, tapit by Joe Nevills. Bookmark the permalink.